On February 8, 1855, the residents of Devon county in England woke up to a blanket of freshly fallen snow. But it wasn’t the precipitation that took residents by surprise—it was what they found imprinted in it. There, stretching on for more than 100 miles, was a trail of footprints. The tracks traveled up to doors and across roofs, through haystacks and over 14-foot walls; they even crossed the River Exe. And they appeared to be made by something that was bipedal and had cloven hooves. The hooves, legend has it, cut right through the snow and nearly to the ground below—almost as if they had been burned there. Perhaps, people reasoned, a kangaroo had escaped from a nearby private zoo. It would explain the bipedal tracks, and kangaroo footprints do make an odd shape. Badgers also make bipedal tracks, and this seems like a much more plausible explanation than an escaped kangaroo. However, it’s doubtful that a badger could have traveled that far in one night. The improbable tracks could have been made by a stray weather balloon or hot air balloon dragging an anchor. This theory helps explain the tracks on rooftops and over tall garden walls—but no lost balloon was ever reported at the time. People also argued that a balloon dragging an implement would almost certainly have gotten tangled up in a tree at some point, leaving evidence of its journey. The way the rain hit the snow and froze could have made the marks, some people theorized, but their uniform, linear pattern makes that theory seem a bit far-fetched. A few animals, including a wood mouse native to the area, are known to hop. 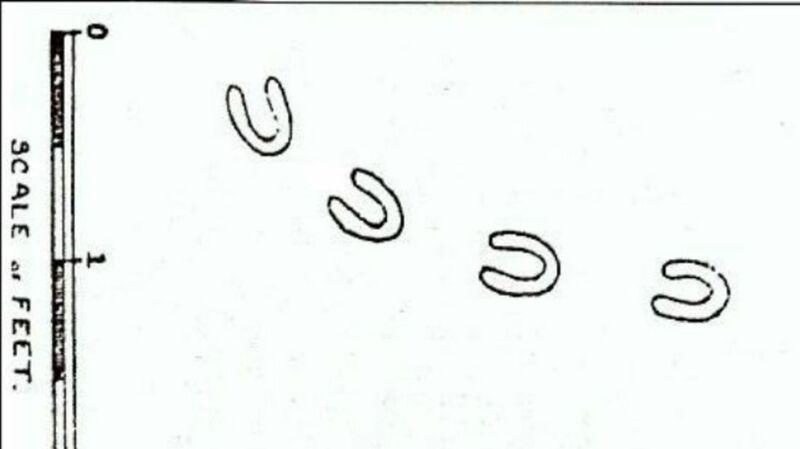 This can leave a hoof-type print because of how the animals hold their feet together while hopping. But it's unlikely that a mouse would sustain a hopping motion for very long, so the fact that the footprints stretched for miles makes this a suspect theory. The mystery was reignited in 2009 when a woman in North Devon discovered footprints similar to the 1855 marks in her garden. The 5-inch long prints appeared to have been made with a pair of hooves, and by something with a stride of between 11 and 17 inches.